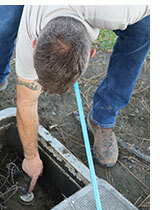 If you have a water meter, the first thing to do is make sure nobody’s using the water. Shut everything off. No showers, no laundry, no dishwasher, no flushes. Next, take a look at the meter itself. You’ll see either a needle or a triangle. If it’s moving, you’ve got a leak. Your plumbing system should have two shut-off valves: one for the hot water and one for the cold water. The hot-water shut-off is located at the hot water heater. The cold-water shut-off is located where the water enters the building or house. Shut off these valves, one at a time, then check the meter to determine a.) if your leak is inside or outside and b.) if it’s on the hot-water or cold-water side. You may find a very warm area on the floor, ranging in size from a few square feet to half a room. This indicates a break on the hot-water plumbing under the slab. When water travels through pipes, it makes an audible noise. You’ve doubtless heard the water running when your toilet tank is filling. Often, you’ll hear a similar sound when a pipe is leaking.